We must, like goldsmiths, carefully sweep our shops, and gather up the filings of the gold which God has given us in the shape of time. Charles Haddon Spurgeon (June 19, 1834 – January 31, 1892) was a British Baptist minister and writer. If religion be false, it is the basest imposition under heaven; but if the religion of Christ be true, it is the most solemn truth that ever was known! It is not a thing that a man dares to trifle with if it be true, for it is at his soul's peril to make a jest of it. If it be not true it is detestable, but if it be true it deserves all a man's faculties to consider it, and all his powers to obey it. It is not a trifle. Briefly consider why it is not. It deals with your soul. If it dealt with your body it were no trifle, for it is well to have the limbs of the body sound, but it has to do with your soul. As much as a man is better than the garments that he wears, so much is the soul better than the body. It is your immortal soul it deals with. Your soul has to live for ever, and the religion of Christ deals with its destiny. Can you laugh at such words as heaven and hell, at glory and at damnation? If you can, if you think these trifles, then is the faith of Christ to be trifled with. Consider also with whom it connects you—with God; before whom angels bow themselves and veil their faces. Is HE to be trifled with? Trifle with your monarch if you will, but not with the King of kings, the Lord of lords. Recollect that those who have ever known anything of it tell you it is no child's play. The saints will tell you it is no trifle to be converted. They will never forget the pangs of conviction, nor the joys of faith. They tell you it is no trifle to have religion, for it carries them through all their conflicts, bears them up under all distresses, cheers them under every gloom, and sustains them in all labour. They find it no mockery. The Christian life to them is something so solemn, that when they think of it they fall down before God, and say, "Hold thou me up and I shall be safe." And sinners, too, when they are in their senses, find it no trifle. When they come to die they find it no little thing to die without Christ. When conscience gets the grip of them, and shakes them, they find it no small thing to be without a hope of pardon—with guilt upon the conscience, and no means of getting rid of it. And, sirs, true ministers of God feel it to be no trifle. I do myself feel it to be such an awful thing to preach God's gospel, that if it were not "Woe unto me if I do not preach the gospel," I would resign my charge this moment. I would not for the proudest consideration under heaven know the agony of mind I felt but this one morning before I ventured upon this platform! Nothing but the hope of winning souls from death and hell, and a stern conviction that we have to deal with the grandest of all realities, would bring me here. It lies not in man's right nor in man's power truly to justify the guilty. This is a miracle reserved for the Lord alone. God, the infinitely just Sovereign, knows that there is not a just man upon earth that doeth good and sinneth not, and therefore, in the infinite sovereignty of His divine nature and in the splendor of His ineffable love, He undertakes the task, not so much of justifying the just as of justifying the ungodly. God has devised ways and means of making the ungodly man to stand justly accepted before Him: He has set up a system by which with perfect justice He can treat the guilty as if he had been all his life free from offence, yea, can treat him as if he were wholly free from sin. He justifieth the ungodly. For my part, I love to stand foot to foot with an honest foeman. To open warfare, bold and true hearts raise no objections but the ground of quarrel. It is rather covert enmity which we have most cause to fear and best reason to loathe. That crafty kindness which inveigles me to sacrifice principle is the serpent in the grass -- deadly to the incautious wayfarer. Wisdom is, I suppose, the right use of knowledge. To know is not to be wise. Many men know a great deal, and are all the greater fools for it. There is no fool so great a fool as a knowing fool. But to know how to use knowledge is to have wisdom. To play the second fiddle well. There are a few of us who could scarcely do more than we are doing of our own regular order of work, but there may yet be spare moments for little extra efforts of another sort which in the aggregate, in the run of a year, might produce a great total of real practical result. We must, like goldsmiths, carefully sweep our shops, and gather up the filings of the gold which God has given us in the shape of time. Select a large box and place in it as many cannon-balls as it will hold, it is after a fashion full, but it will hold more if smaller matters be found. Bring a quantity of marbles, very many of these may be packed in the spaces between the larger globes; the box is full now, but only full in a sense, it will contain more yet. There are interstices in abundance into which you may shake a considerable quantity of small shot, and now the chest is filled beyond all question, but yet there is room. You cannot put in another shot or marble, much less another cannon-ball, but you will find that several pounds of sand will slide down between the larger materials, and even then between the granules of sand, if you empty pondering there will be space for all the water, and for the same quantity several times repeated. When there is no space for the great there may be room for the little; where the little cannot enter the less can make its way; and where the less is shut out, the least of all may find ample room and verge enough. Our great object of glorifying God is to be mainly achieved by the winning of souls... Do not close a single sermon without addressing the ungodly. I would not have you exchange the gold of individual Christianity for the base metal of Christian Socialism. One Lost Sheep, Sermon 2083; Delivered On Lord’s Day Morning, April 28, 1889, at The Metropolitan Tabernacle, Newington. This sentence truly describes the character of that glorious man of God. Among all those who have been born of women, there has not risen a greater than John Calvin; no age, before him ever produced his equal, and no age afterwards has seen his rival. In theology, he stands alone, shining like a bright fixed star, while other leaders and teachers can only circle round him, at a great distance — as comets go streaming through space — with nothing like his glory or his permanence. Gleanings Among the Sheaves, Holiness, reported in Hoyt's New Cyclopedia Of Practical Quotations (1922), p. 369. The Word of God can take care of itself, and will do so if we preach it, and cease defending it. See you that lion. They have caged him for his preservation; shut him up behind iron bars to secure him from his foes! See how a band of armed men have gathered together to protect the lion. What a clatter they make with their swords and spears! These mighty men are intent upon defending a lion. O fools, and slow of heart! Open that door! Let the lord of the forest come forth free. Who will dare to encounter him? What does he want with your guardian care? Let the pure gospel go forth in all its lion-like majesty, and it will soon clear its own way and ease itself of its adversaries. In agony unknown He bleeds away His life; in terrible throes He exhausts His soul. "Eloi! Eloi! lama sabachthani?" And then see! they pierce His side, and forthwith runneth out blood and water! This is the shedding of blood, the terrible pouring out of blood, without which, for you and the whole human race, there is no remission. God works, and therefore we work; God is with- us, and therefore we are with God, and stand on His side. I believe that when Paul plants and Apollos waters, God gives the increase; and I have no patience with those who throw the blame on God when it belongs to themselves. I think I speak not too strongly when I say that a church in the land without the Spirit of God is rather a curse than a blessing. If you have not the Spirit of God, Christian worker, remember you stand in somebody else's way; you are a tree bearing no fruit, standing where another fruitful tree might grow. Doubts about the fundamentals of the gospel exist in certain churches, I am told, to a large extent. My dear friends, where there is a warm-hearted church, you do not hear of them. I never saw a fly light on a red-hot plate. This is faith, receiving the truth of Christ; first knowing it to be true, and then acting upon that belief. God looketh upon any thing we say, or any thing we do, and if He seeth Christ in it, He accepteth it; but if there be no Christ, He putteth it away as a foul thing. Can you by humble faith look to Jesus and say: "My substitute, my refuge, ray shield; Thou art my rock, my trust; in Thee do I confide? "Then, beloved, to you I have nothing to say, except this: " Never be afraid when you see God's power; for now that you are forgiven and accepted, now that by faith you have fled to Christ for refuge, the power of God need no more terrify you than the shield and sword of the warrior need terrify his wife and child." If you tell your troubles to God, you put them into the grave; they will never rise again when you have committed them to Him. If you roll your burden anywhere else, it will roll back again like the stone of Sisyphus. I would sooner walk in the dark, and hold hard to a promise of my God, than trust in the light of the brightest day that ever dawned. Sermons delivered in Exeter Hall, Strand, during the enlargement of New Park Street Chapel, Southmark (1855) London: Alabaster & Passmore and James Paul. It is a great deal easier to set a story afloat than to stop it. If you want truth to go round the world you must hire an express train to pull it; but if you want a lie to go round the world, it will fly: it is as light as a feather, and a breath will carry it. It is well said in the old proverb, "A lie will go round the world while truth is pulling its boots on." Nevertheless, it does not injure us; for if light as feather it travels as fast, its effect is just about as tremendous as the effect of down, when it is blown against the walls of a castle; it produces no damage whatever, on account of its lightness and littleness. Fear not, Christian. Let slander fly, let envy send forth its forked tongue, let it hiss at you, your bow shall abide in strength. Oh! shielded warrior, remain quiet, fear no ill; but, like the eagle in its lofty eyrie, look thou down upon the fowlers in the plain, turn thy bold eye upon them and say, "Shoot ye may, but your shots will not reach half-way to the pinnacle where I stand. Waste your powder upon me if ye will; I am beyond your reach." Then clap your wings, mount to heaven, and there laugh them to scorn, for ye have made your refuge God, and shall find a most secure abode. Delivered on Sabbath Morning, December 9th, 1860, by the REV. 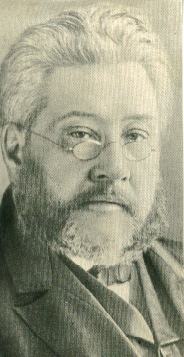 C. H. Spurgeon At Exeter Hall, Strand. Oh, my brothers and sisters in Christ, if sinners will be damned, at least let them leap to hell over our bodies; and if they will perish, let them perish with our arms about their knees, imploring them to stay, and not madly to destroy themselves. If hell must be filled, at least let it be filled in the teeth of our exertions, and let not one go there unwarned and unprayed for. Faith's Checkbook at What Saith the Scripture? Librivox Six sermons from May 1858. In audio by volunteer readers from England. Book Academy 100's of Spurgeon recommended commentaries for FREE!! This page was last edited on 22 November 2018, at 17:58.